Sir Peter Markham Scott CH CBE DSC FRS (1909 - 1989) was the son of the Antarctic explorer Captain Robert Falcon Scott, who lost his life during an expedition the South Pole in 1911. 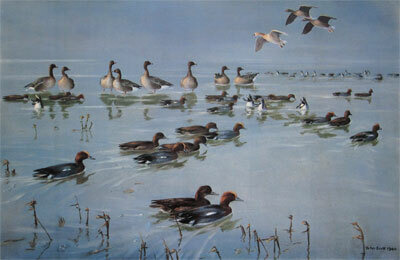 Born in London, Peter Scott studied Natural Sciences and the History of Art at Cambridge University, and became a naturalist, conservationist, ornithologist, artist, broadcaster and author, whose abiding passion was wildlife, and wildfowl and wild birds in particular. Scott was also a fine sailor, winning a bronze medal in the 1936 Olympics, a champion glider pilot, and was an accomplished scuba diver. He served in the Royal Navy during World War 2, and was awarded the Distinguished Service Cross for bravery. Described as the 'father of conservation', he led a campaign for endangered wildlife that captured the imagination of a generation, and inspired many to care about wildlife and the environment long before it became mainstream to do so. He founded the Severn Wildfowl Trust (now the Wildfowl and Wetlands Trust or WWT) at Slimbridge in 1946, and co-founded the World Wide Fund for Nature (now the World Wildlife Fund or WWF). Peter Scott travelled the world observing natural history, and always kept a record in words and pictures. Out in the field, he sketched what he saw, using whatever medium came to hand - pen, pencil, ball-point or felt-tip - adding colour with pastel or paint. His Travel Diaries of a Naturalist (3 volumes - first published 1983), include a large number of the sketches and paintings he produced on his travels. He was the founder President of the Society of Wildlife Artists, and was highly regarded as a wildlife artist, having work accepted for exhibition at the Royal Academy. In the period before and after the Second World War, Peter Scott was widely considered to be the most popular artist in the United Kingdom. 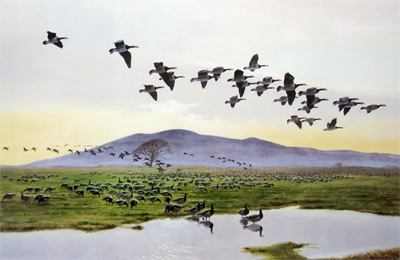 Peter Scott used his artistic talents to fund his projects, and he is best known today for his paintings of flocks of geese and ducks in the air against a sunrise or sunset background. He held his first one-man exhibition of paintings at London art dealers Ackermann and Son Ltd. in 1933, and Ackermann sold many of the artist's originals in the following years. From 1936 to 1982 Ackermann published high quality reproduction colour prints of Sir Peter's work. Many of the originals are in major private and public collections, while his bird art prints remain highly collectable today. A service to celebrate the life of Sir Peter Scott was held at St. Paul's Cathedral on 20th November 1989, with the first lesson read by HRH The Duke of Edinburgh, the president of the Worldwide Fund for Nature at that time.